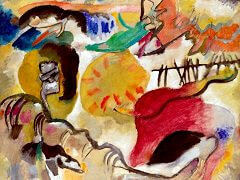 As the Der Blaue Reiter Almanac essays and theorizing with composer Arnold Schoenberg indicate, Kandinsky also expressed the communion between artist and viewer as being available to both the senses and the mind (synesthesia). 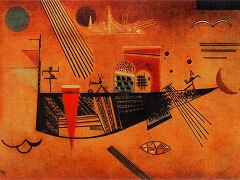 Hearing tones and chords as he painted, Kandinsky theorized that (for example), yellow is the colour of middle C on a brassy trumpet; black is the colour of closure, and the end of things; and that combinations of colours produce vibrational frequencies, akin to chords played on a piano. 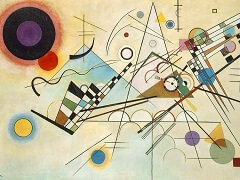 Kandinsky also developed a theory of geometric figures and their relationships - claiming, for example, that the circle is the most peaceful shape and represents the human soul. These theories are explained in Point and Line to Plane. 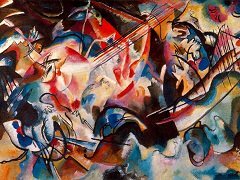 During the studies Kandinsky made in preparation for Composition IV, he became exhausted while working on a painting and went for a walk. While he was out, Gabriele Munter tidied his studio and inadvertently turned his canvas on its side. 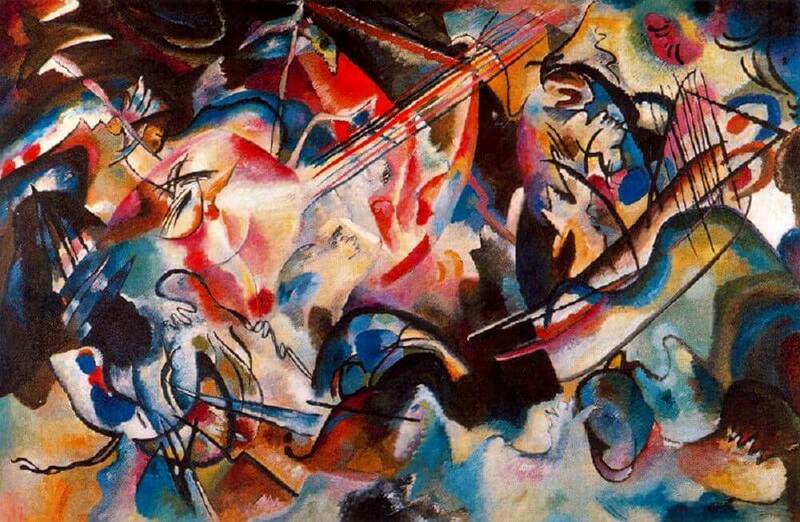 Upon returning and seeing the canvas (but not yet recognizing it) Kandinsky fell to his knees and wept, saying it was the most beautiful painting he had ever seen. He had been liberated from attachment to an object. As when he first viewed Haystacks of Claude Monet, the experience would change his life. 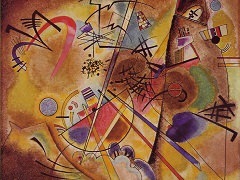 In another episode with Munter during the Bavarian abstract expressionist years, Kandinsky was working on his Composition VI. From nearly six months of study and preparation, he had intended the work to evoke a flood, baptism, destruction, and rebirth simultaneously. 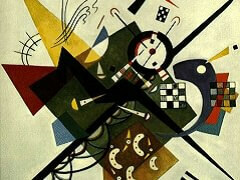 After outlining the work on a mural-sized wood panel, he became blocked and could not go on. 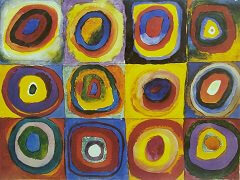 Munter told him that he was trapped in his intellect and not reaching the true subject of the picture. She suggested he simply repeat the word uberflut ("deluge" or "flood") and focus on its sound rather than its meaning. 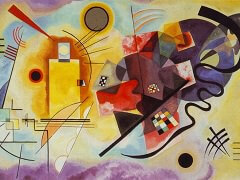 Repeating this word like a mantra, Kandinsky painted and completed the monumental work in a three-day span.